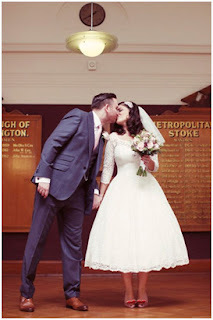 Here at Rock my Vintage we love nothing more than a good wedding. So much so, we have decided to launch our own Wedding Wednesdays - a weekly feature where we will be sharing styling ideas, outfit guides and general wedding inspiration for you lovely ladies - no matter what part you have to play in the BIG DAY. So, without further ado, let’s get things started! We love this ridiculously cool bride's 1920’s inspired wedding look! Who said you have to wear a floor length gown on your big day? Nothing says vintage bride more than a flapper style dress with lots of intricate beading and bling for that perfect Great Gatsby feel. Our beaded silver flapper dress is perfect for a bride looking for something slightly different but that still makes an impact and remains undeniably bridal. With its hand sewn sequins and beads, modern cut out detailing and champagne tone, this vintage style dress exudes 1920s glamour and elegance. 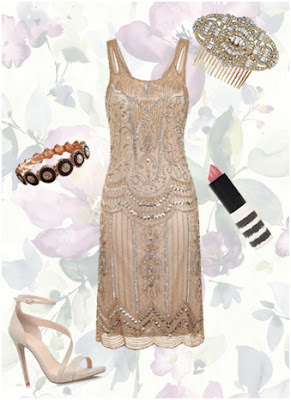 Complete the twenties wedding look with simple makeup, strappy heels and Art Deco Style Jewellery. We will see you next week for more whimsical Wednesday Weddings!